Pickomino features in my list of Top 5 Gateway Games (as one of the fillers in the listing for Archaeology: The Card game) and deserves a little more love here thanks to its great versatility. Like the others games I’ve reviewed to date, I can’t imagine a time when I wouldn’t want this in my collection. 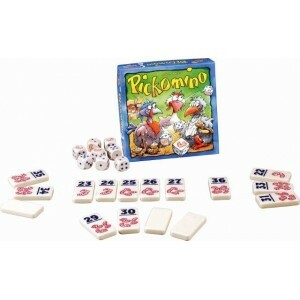 Pickomino is a small box push-your-luck dice game that is not a million miles from the realms of Yahtzee, but with a crucial ‘take that’ element that elevates it into a great filler or party game. It is very simple to learn and teach, plays two to seven players and usually plays in 20 to 30 minutes. There is a solo version of the game available on Facebook that gives a good idea of how the mechanics work, minus the important element of messing with the other players. It was actually the Facebook version that introduced both my girlfriend and me to the game. It’s a great implementation with a nicely worked dragon theme (compared to the rather odd ‘chicken and worm’ theme of the current dice version) that is a good introduction to the basic rules, which are (very roughly) as follows. A total of 16 scoring tiles are placed in the middle of the table, numbered 21 through 36 and with end-game scoring values (in worms) of one through four (four of each value, in ascending order, so 21-24 are worth one point, 25 to 28 two points etc). On each of your turns you will roll eight dice and try to score enough during your rolling to score a tile. The dice are standard six-siders with one exception – the ‘six’ is replaced with the picture of a worm (or dragon on Facebook) and also scores as a five. To start your turn, you roll all eight dice. You then keep all of any one face up side (all the worms for example, or all the fives) – this starts your total score for the round. Unless you’re very lucky you will then pick up the remaining dice and reroll, following the same procedure until you have enough scoring dice to take a tile (or are bust). But here’s the triple twist. First, you can’t keep dice of any number you’ve already put aside (so if you took the fives the first time, you can’t take them again), or chose to reroll those you’ve already kept. Second, you have to have at least one saved worm to be able to score and take a tile. And thirdly, if you get no worms or roll all remaining dice and can’t take any because they are all duplicates, you’re bust for that go. In the right group, this is great fun in itself. Tension builds if you’re going for a tough tile or there aren’t many left, while you’ll be howled at my your peers if you take a low tile when you were on a great roll but duck out of taking a risk for a bigger one. Scoring tiles is simple – the most common play is to take the highest value tile you can get from those available in the middle. You can take any tile of the same value as your total roll or less from there, with the highest value one usually being the best option. However, here’s where the real interaction comers in. When you take a tile, you put it in front of you – each subsequent tile you take is put on top of the one before, giving you (hopefully!) a stack. But if someone’s final score on a turn come to the exact total of your top tile, they can steal it from you rather than taking one from the centre of the table. This second social element of the game really seals the deal for me. If you have tiles in front of you, but fail to make a score (by going bust, or getting no worms), you have to put your top tile back with the others that can still be claimed. If it isn’t the highest value tile left available (say, the 36), the highest tile that is left is removed from the game. This means however bad everyone is rolling, the game can’t go on too long! Once all the tiles are either taken by players or out of the game, you add up the worms (points) in your stack – whoever has the most wins (with highest numbered tile breaking ties). Pickomino is a simple, cheap and fast game that really is more than the sum of its parts. You can play as a couple wherever you are (as easily on a plane as you could at home) or with a drunken rabble (we recently took it camping to a music festival where it went down a storm). The current version (often called Heckmeck) retails at just around £15 in the UK, but has average dice and nice Mahjong-style tiles – making it weather proof too. Sure, it’s not got much in terms of tactical or strategic depth, but all your decisions being made out in the open makes for a great atmosphere and as everyone tends to be watching what others roll, cajoling and ‘advising’, it doesn’t tend to feel like there’s as much downtime as there actually is. But I preface that once more with the fact you need the right group, or the right atmosphere (preferably both), to really make it sing. I play Pickomino because it puts a smile on the face of the people who play it, it doesn’t outstay its welcome and it has quality components that travel well. This would be the first game into my bag for any trip (probably alongside Archaeology: The Card Game) and I’d recommend it to anyone who likes the occasional push-you-luck dice fest.